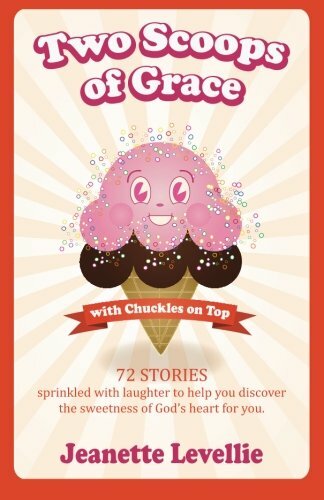 In her book, “Two Scoops of Grace with Chuckles on Top,” Jeanette Levellie wants us to know right up front that God is a gracious God. He’s perfect, but not a perfectionist. He watches over us, but not with an abacus on hand, ready to count our failures. Her stories, told in devotion style, could be read one a day (so you can savor them slowly) or as many as you like at a time. She’s an expert storyteller so it may be hard to put this one down. One thing I will say, Jeanette has a keen wit. It’s a gentle and kind wit. And it’s most often at her own expense because she’s learned to laugh at herself. She’s a mother of two children and a pastor’s wife. She has bright red hair which she claims can be as unruly as she is. That’s another thing about Jeanette, she’s honest about her failings as much as she is about her love for God. If I was a betting kind of gal, I’d bet she has oodles of friends who love being in her company. In addition to the delicious fact that there’s ice cream on the cover, the book is full of stories to which we can relate. Even if we’re not a pastor’s wife or have children. Even if we’re brunettes or silver-haired beauties. I’m guessing the target audience is women. But when you know men who occasionally wonder whether God is really there for them; whether His grace can forgive the messes they make; if the dreams they dreamed will ever come true; or the future holds any promise–Two Scoops of Grace is a book you might want to recommend. Inside are 72 story devotions ranging from Drive-by Diapers, Culture Shock, A Pitiful Piece of Pie, and From Hair to Eternity. While the author insists we be gentle with ourselves and laugh a lot more, she also uses her stories and the Word of God to help us remember the path we’re called to walk. The devotions are comedic and convicting at the same time. And that can be refreshing. The words ‘grace’ and ‘chuckles’ had to be in the title of this delightful book. Because, in this life, we desperately need them both. Don Keele has spent his career pastoring teens and young adults and helping them engage in church ministry. This book, humorous and challenging even to adults, is a written vehicle for doing so. Through the power of story, Keele examines areas of strength as well as weakness in himself. We get to know him as he was as a youngster, a teen, and an adult. He tells on himself and it’s an endearing thing to see. Too often, Christians fail to make connections with the unchurched (not to mention with one another) because of a desire to not seem vulnerable. But the lessons we need to learn, implied in Keele’s parables, come when we admit how much we need our Savior. In “Smells,” the first story in Ed’s Tohlet, he starts off right. Not only does he indicate how we can be unaware of our spiritual need, he offers the reader a chance to decide to be one with Christ. And isn’t that the starting point for us all? Keele handles such topics as bullying, Christian service (this is where the ‘tohlet’ comes in), pain, faith in our prayers, accepting God’s “No,” obedience, and more. While directed at a teen audience, this Christ follower found wisdom to follow and even took some notes. At times, Don gets a little off-topic (and sometimes he admits it). Sometimes he seems a might preachy. But his stories really are funny in places. They really do point us to our own experiences with peer pressure, temptation, and a need to belong. They’re not just the needs of teenagers. God has challenged me in a specific area and take I it seriously. After reading “COPS,” the author’s story about being pulled over and witnessing an arrest, the challenge God extends is even more real. That would the challenge to bear witness of God’s love and goodness to the world. Not just to those whom we celebrate with on the Sabbath and in our Christian huddles. Agatha Christie still sells books after her death. In fact, the only books selling more widely than hers are the works of Shakespeare and The Holy Bible. She’s been called the queen of her genre. And that’s fitting because her stories for the most part are well-told. I’m a fan of the Poirot mysteries, The Murder of Roger Ackroyd being my favorite. 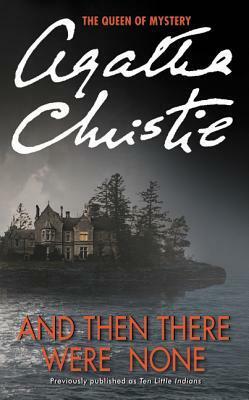 With And Then There Were None, she takes us to Soldier Island to figure out the murders of ten individuals as they ‘disappear’ according to a childhood rhyme. The mystery keeps us guessing and I was surprised at the end. However, Christie tends to tie things up in a bow at the end and the device wearies me sometimes. The actual story with the characters dying one after the other kept me going. Then … well, I don’t write spoilers into my reviews. Even though I liked the ending, I’m not so sure I like how she wrote it. But it is indeed a twist that reminds me of the Ackroyd mystery. Pretty slick. I wouldn’t keep reading Christie’s mysteries if I didn’t enjoy them. For that matter, neither would millions of other readers. I’m glad I don’t have to review the actual writing, (just the story) because some of it is horrible. Eyes don’t ‘land’ on anything unless they’re falling out of your head. That’s only one example of writing that distracts me; for the sake of the story itself, I chuckle and move on. If I ever as a writer become as prolific as Christie, or if people begin paying me for reviews, then I suppose my ‘learned’ comments on writing will be more welcome. This particular novel was originally published as Ten Little Indians and has been adapted for the stage and screen. I saw a version of it on television decades ago and enjoyed the story then as well. All in all, it’s a fun read. “The TouchPoint: Connecting With God Through the Bible” By Bob Santos; 2016 by Search for Me Ministries, Inc. However you see the Bible right now–a book of instructions, a book about history, or a book of stories–author Bob Santos wants you to see the bestselling book of all time as a way to create a relationship with God or continue to improve the relationship you now have. Topics covered in the book include the authority of scripture, an overview of the Bible, the relationship between science and faith, preparing one’s heart for study, and the Bible’s credibility, among others. Throughout, Santos writes clearly and simply, which makes for relatable content. Readers won’t likely feel they’re being talked down to. Perhaps this is because Santos, founder and president of Search for Me Ministries, describes himself as “an average guy” relying on the anything-but-average grace of God. He’s found ways to ‘touch’ God and one way is through scripture. Even though the book is written in simple language, The TouchPoint offers food for thought you can chew on even after moving to the next chapter. There’s meat in what Santos has to say. Just as Christians are encouraged to graduate from milk to meat, Bible reading and study should create, not only changed behavior but an increased intimacy with God. According to the author, the Bible is where we learn who God is. That partially answers the “Why should I read it?” question. When we understand who God says He is, we’re better able to develop intimacy, which is Santos’ purpose for writing: to help us discover connections with the Almighty. In every chapter, Santos reveals more and more of “What will I find?” within the Bible’s pages. He includes scripture to support the explanations he gives. What may be just as important to many readers is his inclusion of personal experience. Since God showed the author how to know Him and create a closer relationship, Santos can pass that information on, knowing God will keep the promise of meeting you right where you are. In addition to being extremely readable, The TouchPoint exhibits humor. Santos is obviously able to laugh at himself, using phrases like “cranial ability” and “frustrated and disgruntled bandits.” Using such language, he holds the reader in with, again, relatability. Each chapter held my attention because I’m already convinced that reading and studying the Bible is a good idea. My highlighter hit the page more often than in other chapters when I got to “What About Science?” Here, Santos includes some hefty comparisons. He argues as well as any apologist for how God’s word is believable. This idea is crucial. If the Bible isn’t believable, where can we find hope? Bingo. Santos had me at “grim reality.” We all need hope. Hope, found in a relationship with Jesus Christ, answers the question, “What’s the point?” Read between the lines and you’ll see that Santos is trying to tell us Jesus is always the point. While Santos may disgruntle a few readers with his views or his seeming lack of formal training in the Bible, it’s good to remember that apostles Peter and John were “unschooled, ordinary men.” The Spirit of God works through whomever He wills. Give yourself permission to be a little disgruntled if you must. Anyone, Christian or not, will find answers in The TouchPoint to questions about how reading the Bible can change a life. Combining thoughtful content with grace-filled delivery in a highly readable format, The TouchPoint is a book for people hoping to connect with God for the first time or for those looking for reasons to enjoy a deeper relationship with Him than they already have. Hello, Media Monday, when we talk about books, movies or music. Today’s offering: “The Red Letter Life: 17 Words From Jesus to Inspire Simple, Practical and Purposeful Living” by Bob Hostetler. The adjectives in the subtitle of this book, The Red Letter Life give us a hint into Bob Hostetler’s message for living as a disciple of Jesus. 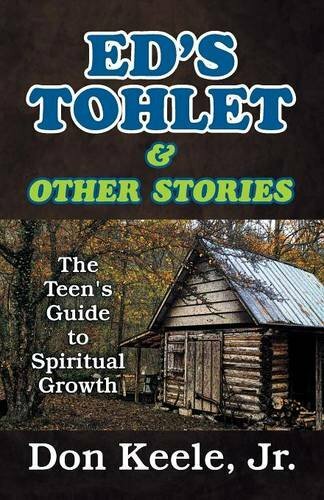 Hostetler writes with purpose; his message is practical; and his writing is simple so anyone can understand it. Hostetler has delivered his message in a ‘pure’ way: truth, grace, simplicity and clarity of thought are all in place. Sure, he uses his knowledge of Greek to explain things. But he only does it to enhance the message. I never got the feeling I was being talked down to because these explanations are not overdone. 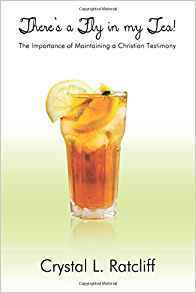 The seventeen words chosen are excellent choices and indicate the author’s careful study of Jesus’ message and mission. From “Come” to “Go,” every word inspires us to deeper relationship with Christ and a call to carry out His mission as commanded. Often, we get to see Jesus, his disciples and the people He encountered with fresh eyes. Expect some “Aha” moments. Hostetler has a way of telling stories which not only lend themselves to giving meaning to his message, they often are entertaining and sublime. That’s the way Jesus Himself told parables. Overall, his heart and personality shine through. He makes being a Christian sound challenging and enjoyable at the same time. After reading The Red Letter Life, I would enjoy sitting down with the author, simply talking about our respective spiritual journeys. While not your typical Bible study text (with questions for participants to explore), the book could certainly be used as such because Bob offers a challenge at the end of each chapter. At any rate, the book begs to be discussed. Lately, I read less Christian non-fiction than I used to, choosing more often to study the Bible. While there is no substitute for God’s Word, there are certainly excellent supplements. This one happens to be one of them. You can find Bob–a speaker, blogger and pastor, in addition to being an author–in “Stuff I Read.” He’s the One Prayer Daily fellow. Last week “Whatever” spoke to the importance of sharing with others our story of coming to faith in Jesus Christ. This week, I’m offering a book review dealing with the same subject: evangelism. The topic is evangelism. Or is it fishing? In Mark O. Wilson’s book, Purple Fish, both activities become his topic. The book is peppered with stories of Jesus–and everyday people–“fishing for men.” You’ll also find stories about fishing for…well…fish. The title comes from a Greek word, kalchaino, meaning “to search for the purple fish.” The purple fish referred to is highly treasured because of the deep purple dye found in this particular shellfish. Therefore, the treasured purple fish became the metaphor for Mark’s book. The purple fish secret, according to Wilson, is “more about attitude and perspective than technique.” And that’s why he doesn’t use “techniques.” Naturally, Wilson has advice for going forward with evangelism efforts. At the top of the list is prayer. If he has any kind of technique, it comes from his acrostic for finding connecting points with people. Purple Fish is a book with simple ideas for evangelism, patterned after Christ’s model of meeting people where they are and approaching in love. Jesus didn’t follow the same method with each encounter and Wilson says this is the key to being the “second witness” in witnessing. The first witness of course, he says, is the Holy Spirit. With thirty-three chapters, the book might seem daunting, but each is a quick read with no chapter longer than seven pages. 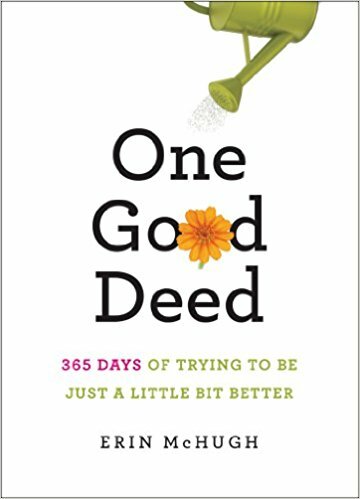 If you’re the type that gets caught up in a book and says, “I just have to get through this next chapter,” this book is a cinch for you. 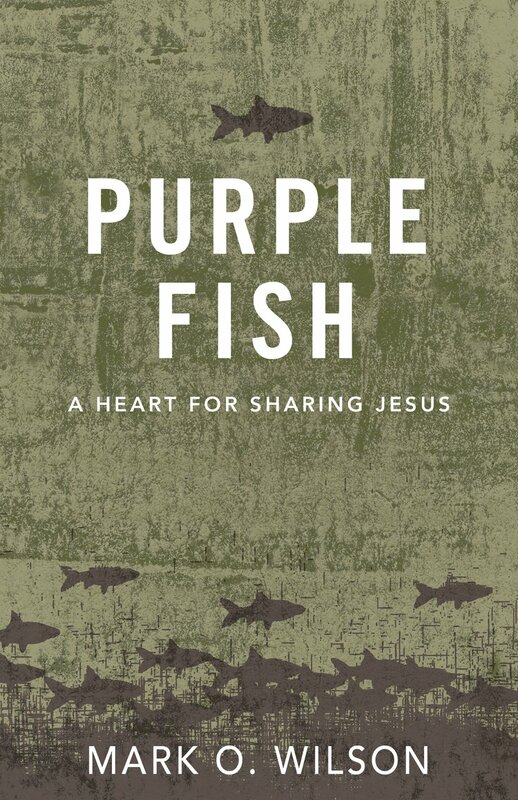 Because the book is written so simply and can be downright entertaining at times, Purple Fish will work well with small groups as well as an adjunct to a sermon series. Rather than being a text book-style reading on how to win people to Jesus, the book seriously and cheerfully mixes stories of fishing for fish and fishing for…well…people. Mark Wilson is a seasoned pastor when it comes to evangelism, having taught nontraditional ministerial students through the Wesleyan FLAME program. He’s developed and put into practice methods that take people into the mission field of their own cities and neighborhoods. From the examples–he calls them ‘treasure hunts’–noted in this book, if his charges aren’t convinced before they begin of God’s power to draw people to Himself, they are convinced at the end of the day. Stylist magazine has put together a list of the 50 Best Christmas Books. Today, to get a bit personal, I selected a few of my favorites. You can tell us in the comments which are your favorites. Were you surprised to see some titles were actually books before they became films? This classic tale of how a miserly and grumpy fellow finds the true meaning of Christmas has been re-enacted on stage and screen for decades. Though I’ve read the book (which is surprisingly short) and seen several versions of the story, my favorite is the old black and white movie I saw as a child. Jacob Marley’s ghost appearing on that door knocker horrified me. Even as children, we enjoy seeing a bad guy go right. The Grinch is another story about finding the simple meaning in the joy of Christmas. Seuss’ art captivates. I read this short story while in junior high school as assigned reading. Suggesting the role Christ plays in our lives, the simple story tells of the sacrifice made by a man and a woman in love. They’re both poor but want to give the other the perfect gift. Here’s a book that was inspired by the Christmas TV special of the same name. With wit and wisdom, Schulz creates some unforgettable moments. The characters dancing to Schroeder’s tiny piano, Charlie searching for a tree for their play and Linus telling Charlie Brown what Christmas is all about. One of my favorite sleuths once again solves a mystery even though he’s supposed to be celebrating the holiday. In all my reading and watching on BBC the stories about Poirot, it’s gratifying to know he is a man of faith. He is dogged in fighting evil and his faith is one of the motivators for exposing criminals. Found in Luke 2 and Matthew 1 of the Holy Bible, the story of Jesus Christ being born is by far my favorite Christmas story. It’s the reason we have a “Christmas.” It’s the reason there are stories about people finding the real meaning of Christmas. This is the story of hope. Jesus is the reason we celebrate. No one will ever steal Him away from us because nothing can separate us from His love. We don’t have to worry about a winter with no Christmas. We can always be sure He’s the best gift, the perfect gift. He’s conquered evil and that’s no mystery. Tell the “greatest Christmas story” to everyone you can. Then tell them why Jesus came. That’s a gift you can give all year long.